Fireplace, dishwasher, microwave, washing machine, telephone (incoming and local calls ), television, pool (7.5m x 3.5m). Final cleaning fee 50 euros. Available for weekends in low season. Inquire. Exterior with its patio and garden. The countryside outside St. Cyprien is in the heart of the Dordogne with its green hills and windy rivers. From here one can visit 16th century castles, medieval towns, and ancient cave paintings. The cuisine is classic French cooking with confit, truffles, goose, walnut oil and foie gras. And for those who love the outdoors this is a wonderful location for river swimming, canoing, hiking and biking. All told, this is a perfect spot for a memorable vacation in this famous region. This charming 17th century cottage stands at the beginning of a tiny hamlet closest to the spring which the entire hamlet once relied on. Now the cottage has been totally restored to provide a cozy and comfortable accommodation in a very pretty spot. The ground floor has a newly renovated kitchen which opens to the living room/dining room with open fireplace. This space has exposed beams, exposed stone walls, new tile floors and and 2 sets of doors that open to the pleasant patio with the pool beyond. A slightly steep new wooden staircase leads upstairs to 2 spacious bedrooms, both rooms tastefully done with white walls, antique wooden bed frames and pleasant matching spreads and curtains. There is a bathroom with shower, sink and toilet. 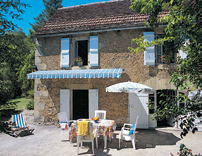 This cottage is cheerful and very well maintained. The grounds are large and are nicely landscaped. "We love the charm of living on a tobacco/dairy farm. Excellent stay. We have stayed here 3 times."